The first time this young man wrestled in his very first tournament fans knew he would be fun to watch. With every passing tournament, after all his practices, he just kept getting better. He smiled when he won and he knew he had to work harder when he lost. There were hard times, he got back up and fought on. 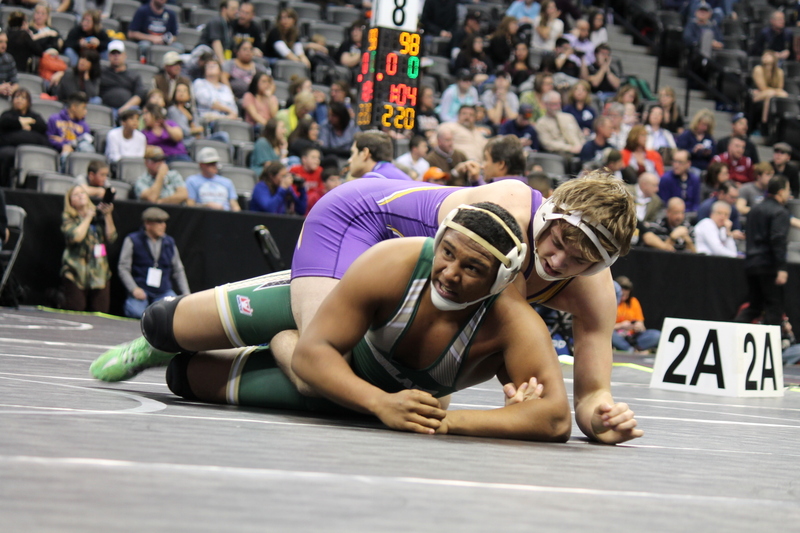 This young man grew into a hardworking, skilled wrestler who found himself in the Pepsi Center in Denver, Colorado at the 2016 - 2A State Tournament on the Championship Mat in front of thousands of people. His family, his friends, and his coaches were all there to watch him and he didn't disappoint. Did he win? No, but he did win more admirers that witnessed sportsmanship at its finest. He was defeated in the last seconds of a championship match and he had more poise then anyone I have known. He shook his opponent's hand, the opposing coaches' hands, and he walked calmly over and hugged his coaches. We all knew he was crushed but he held onto every bit of composure and walked away. That young man is Reagan Lane. Lane worked his way to the championship match in the 160 pound weight class by getting a 2:53 pin over Jon Ramey from Merino; going down to the wire with a big, Trenton Armintrout, from Norwood-Nucla getting him pinned on a move that Lane has been famous for in 5:59. He dominated Chase Rule in his semi-final match, although the score was close, 2-0, and then came up against Sabyn Diamond from Buena Vista. Lane took control with a first takedown and then went to work on turning him for back points. The wrestlers battled back and forth and with 4 seconds left the score would be tied but Diamond grabbed an ankle and Lane fell backwards giving up the 2 points and losing, 6-4. Lane ended his season with a 39-5 record and received the 2nd place medal at the awards stand. His leadership, hard work ethics and infectious spirit will be missed. Trevor Randel also wrestled with determination in the 152 pound weight class, wrestling into Saturday morning before having to go home empty handed, one round short of the medal round. It was a tough weight and Randel showed he was tough enough to compete by getting a 5:04 pin over Braden Witzel from Burlington in his first match. Randel then went up against #1 seed Hayden Harris from Norwood-Nucla. Randel was handed his first lost, 6-2, but only after going six minutes against the 48-5 junior. This would cross bracket Randel into the consolations against Luke Haefili, a 33-14 senior from Del Norte. Randel worked the senior over and came away with a nice 12-6 decision. Saturday morning was heartbreaking for the Eads fans when Randel was eliminated from the tournament by 41-9, senior, Jose Lopez from Monte Vista, 9-2. Randel had wrestled perhaps his best tournament of the season and although this was a tough loss he also handled himself true sportsmanship. Randel ended his season with a 31-14 record and an appetite to return next year. Plainview senior, Seth Splitter, excited fans during his first match of the tournament taking it to James Steerman, 35-9 junior from McClave. Splitter went after Steerman almost immediately after the first whistle and hand the Cardinal flat on his back for the pin in 3:21. Splitter then advanced to the Quarterfinals against Jace Logan, 37-8 freshman, from Sorocco. Logan got the best of Splitter in 3:26 pushing him into the consolation bracket. Splitter then cross bracketed and met up with Hunter Garcia, 35-15 junior, from Meeker. These two rallied back and forth with points but at the final buzzer Garcia was declared the winner, 7-6. Splitter finished his senior season with a 28-19 record. Splitter brought a lot to the Eads program, his leadership and dedication to the sport will be missed. 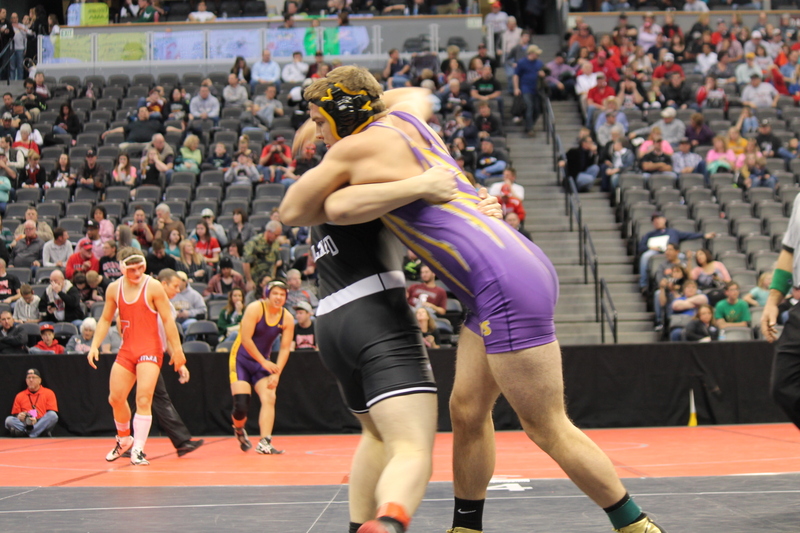 At 170 pounds, Eads junior, Rhett Uhland, attended his first state tournament and although he didn't get a win he did get valuable state experience for his next trip. 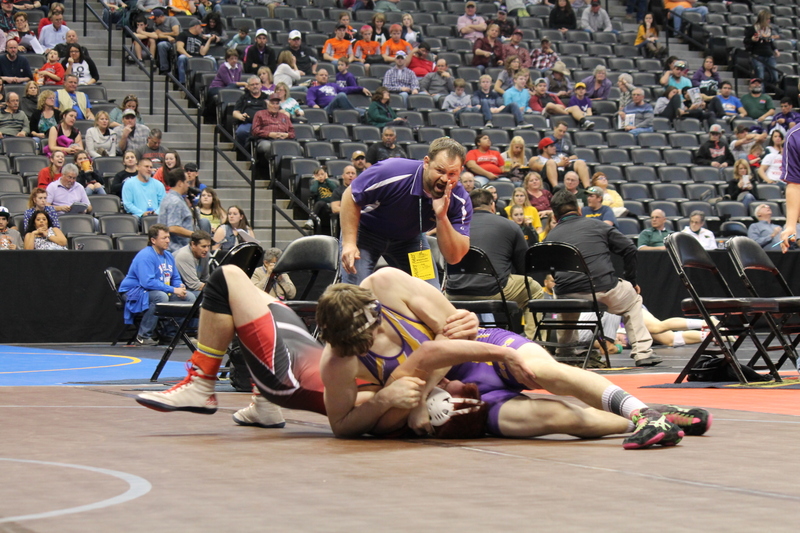 Uhland worked against Edgar Pedigo, an 8-11 sophomore from Custer County until he was caught on his back and Pedigo was awarded the pin in 4:22. Uhland then faced Dillon Donaghy, a 22-16 senior from Wiggins. Uhland was unable to get his mojo going but did fight to the five minute finish but falling short, 6-1. Uhland ended his junior season with a 28-12 record and also hungry for another try at a state medal next year. Trent Mitchek, Eads senior, was attending his 2nd state tournament in his season of wrestling; this time in the 182 pound weight class. Mitchek got surprised by Henry Fellhauer, a 26-8 senior from Fowler, in 0:55. Dropping into the consolation bracket Mitchek went up against Chad Sommerville, 28-15 senior from Highland. Mitchek worked hard but couldn't overtake Sommerville, falling in 2:22. Mitchek ended his senior season with a 28-15 record. This senior also represented Eads with outstanding leadership and will be missed next year. Last but not least was Eads junior, Chance Fowler who was making his second state appearance. Fowler was going into the tournament with a 10-9 record because he was unable to wrestle most of the season due to a knee injury. 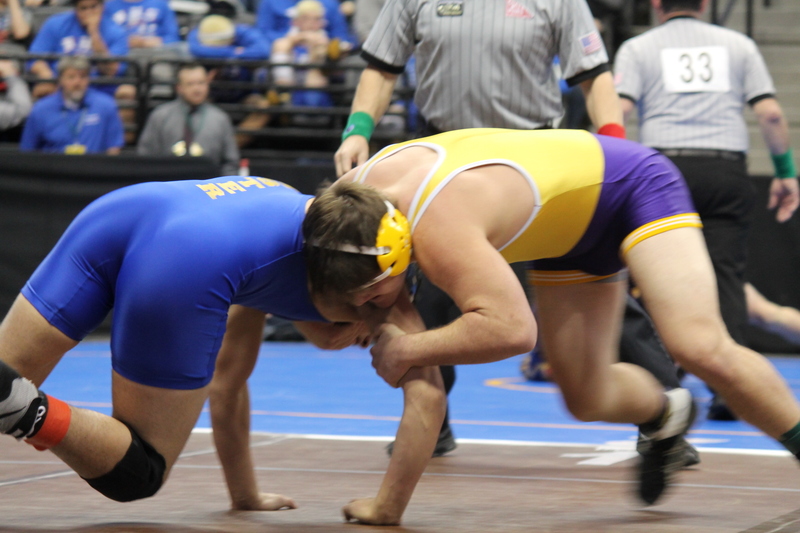 Fowler was also bumped up to the 195 pound weight class to help the team compete during the last part of the season. He started his second state tournament up against a 40-12 junior from Highland, Juancito Lucero. Fowler's athletic ability just couldn't overtake this wrestler's experience and he fell short in 2:35. Fowler was now facing a win and go on, or lose and go home, match against Devin Curtis, a 22-18 sophomore from Hotchkiss. Fowler went after the sophomore but was caught on his back in 1:39 and eliminated from the tournament. Fowler ended his season with a 12-9 record and Eads can look forward to having him back to try again for state hardware. As they say "The 3rd time is a charm!" These six young men have been a pleasure to watch all season. Eads will lose three of these fine young men to graduation but can still look forward to watching the remaining Eagles as they will undoubtedly return bigger, faster, and stronger next year. Remember guys, "If it was easy, everyone would do it!"